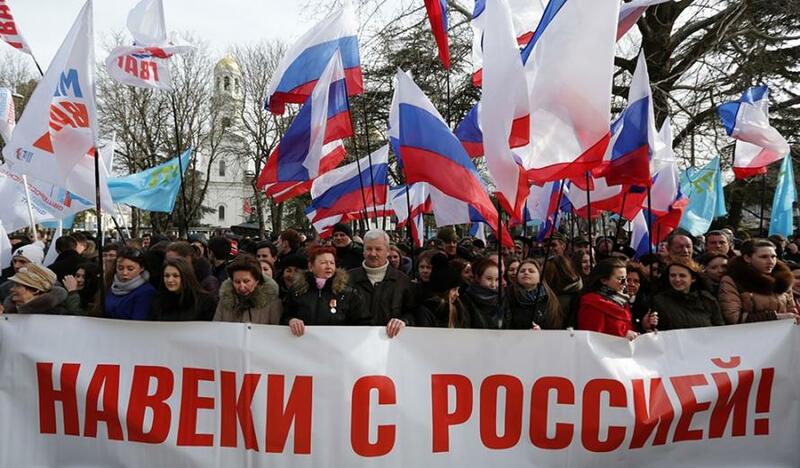 On March 18th, 2014 following a popular self-determination referendum of the people of Crimea the Russian Federation declared reunification with the Crimean Peninsula which was illegitimately transfered to the Soviet Ukraine in 1954 by Soviet Communist Party leader Nikita Khrushchev. Nevertheless, the western global corporative media, politicians and statesmen classified the act as a matter of “aggression, violation of international law and unlawful occupation of a part of territory of an internationally recognized independent state and the UN’s member”. Russia’s authorities on this occasion issued an official statement that Crimea’s re-annexation by Russia is based on the same self-determination rights as of the people (the Albanians) of Kosovo in 2008 which self-proclaimed independence from Serbia (by Kosovo parliament without any popular referendum) is already recognized by almost all western liberal governments. The issue is in this case that Allende was the first Marxist in the world’s history who became elected by the popular vote as the President of one sovereign and independent state. A new President of Chile was a head of the Unidad Popular that was a coalition of the Marxists (Communists) and the Socialists and therefore faced by hostility of the USA whose administration supported Chili Congress against Allende. The Congress backed by the USA heavily opposed Allende’s radical program of nationalization and agrarian reform – a program voted by the electorate in 1970. Due to such obstruction, there were inflation, capital flight and balance-payments deficit which heavily contributed to an economic crisis in Chile in 1973: exactly what the US administration wanted and needed. The crisis became the main excuse for the military coup organized and accomplished by the Chili army Commander-in-Chief general Augusto Pinochet (born in 1915) – a typical local exponent of the US global politics. As a consequence, there were around 15,000 killed people together with President Allende and about 10% of the Chileans who left the country during the new military dictatorship (1973−1990) which replaced Chili democracy elected by the people and brutally abolished all labor unions and any opposition organizations and groups. The capitalism was fully restored with the economy and social order very depended on the US financial support as a price for transformation of the country into a classic (US) colony. Nevertheless, the 1973 military suppression of democracy in Chile was a clear message to the whole Latin America that the Monroe Doctrine of “America to the Americans” (read in fact as “Americas to the US”) is still leading framework of the US foreign policy in this part of the globe. The Monroe Doctrine was articulated in President James Monroe’s seventh annual message to the Congress on December 2nd, 1823. The European powers, according to Monroe, were obligated to respect the Western Hemisphere as the United States’ sphere of interest. Following later such doctrine, for the matter of illustration, there was the US direct military invasion of Panama causing the fall of General Noriega in December 1989: “Operation Just Cause”. Similarly to the Allende Case in Chile, Grenada governed by the President M. Bishop turned to the left in both inner and external policy of the state. Therefore, he encouraged very closer relations with F. Castro’s Cuba and potentially to the USSR. As a result, at the island there were some Cuban military presence composed by the engineers who were repairing and expanding the local airport. This fact became the main reason that political situation in Grenada became of interest of the U.S. administration. However, due to the internal quarrel within the People’s Revolutionary Government, Bishop was overthrown from the post and murdered by another Marxist, Bernard Coard, in 1983 who took control over the Government. There were the clashes of protesters with the governmental troops and soon violence escalated. However, the army troops under the command of General Hudson Austin soon took power and established a new military regime. 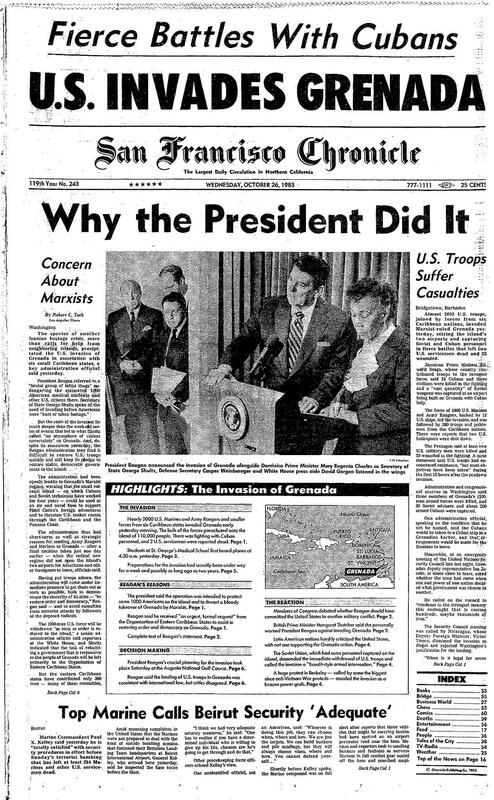 This new Grenada coup was immediately followed by direct US military intervention in the island on October 23rd, under the order by the US President Ronald Reagan (the “Operation Urgent Fury”), for the very real reason to prevent a Marxist revolutionary council to take power. 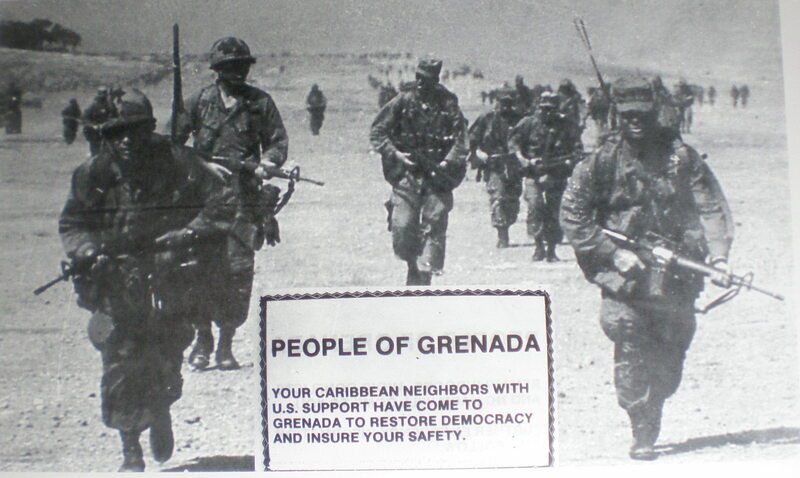 The US military troops left Grenada in December 1983 after the re-establishment of “democratic” (pre-revolutionary) regime and of course pro-American one transforming Grenada into one more Washington’s client state. The fact was that in the 1983 Grenada Case, there were really about 1,000 US citizens in the island, majority of them studying at the local medical school. 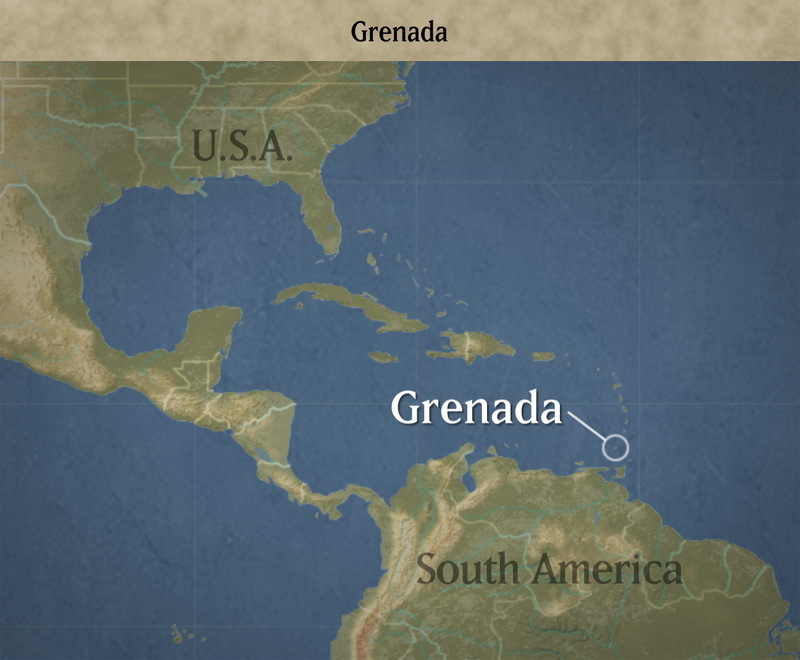 Citing the alleged danger to the US citizens in Grenada, the President ordered around 2,000 US troops, combined by some international forces from the Regional Security System based in Barbados. The White House claimed that it received a formal request for military intervention by the PM of Barbados and Dominica (both the US clients). If it is a true, and probably it is, then any state receiving such invitation by the foreign Governments (second states) has right to invade other state (third state) in order to restore the “democratic” order (in the sense of bringing justice) or at least to protect its own citizens. For instance, following the White House logic from 1983, overthrown legal President of Ukraine V. Yanukovych by the street-mob in 2014 could call the Russian President V. Putin to restore a legal order in whole Ukraine by the Russian army. In regard to the 2014 Kyiv Coup, according to Paul Craig Roberts, Washington used its funded NGOs ($5 billion according to Assistant Secretary of State Victoria Nuland at the National Press Club in December 2013) to begin street protests when the elected Ukrainian Government turned down the offer to join the European Union. Similarly to the Ukrainian coup in 2014, the Guatemala coup in 1954, when democratically elected Government of Jacobo Arbenz became overthrown, was also carried out by the CIA. Following also Reagan’s logic for the military invasion of Grenada in 1983, the Russian President could send a regular army of the Russian Federation to occupy Ukraine for the security reasons of Russia’s citizens who were studying at the universities in Kyiv, Odessa or Lvov. Nevertheless, similar Reagan’s argument was used (among others) and by Adolf Hitler in April 1941 to invade and occupy the Kingdom of Yugoslavia as, according to the German intelligence service, the German minority in Yugoslavia (the Volksdeutschers) were oppressed and terrorized by the new (pro-British) Government of General Dušan Simović after the coup in Belgrade committed on March 27th, 1941.